I guess few of todays ufologists or esotericists have read the novels of Talbot Mundy (William Lancaster Gribbon) 1879-1940. 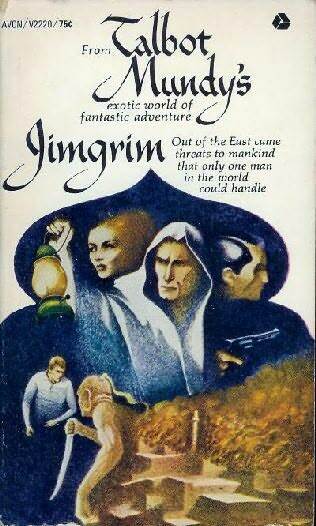 But he was quite popular in the 1920s and 30s and influenced science fiction and fantasy writers like Robert E. Howard, Fritz Leiber and Robert Heinlein. 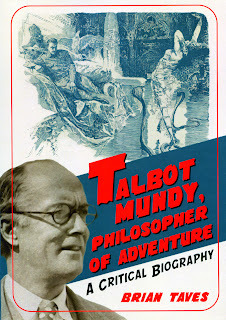 This week I received a copy of Brian Taves, Talbot Mundy, Philosopher of Adventure. A Critical biography (2006). Brian Taves is film archivist for the Library of Congress. The biography chronicles both the adventurous life and philosophical and artistic development of Talbot Mundy. Born in London, England his thirst for adventure took him in his early twenties to India, Africa and the Far East. 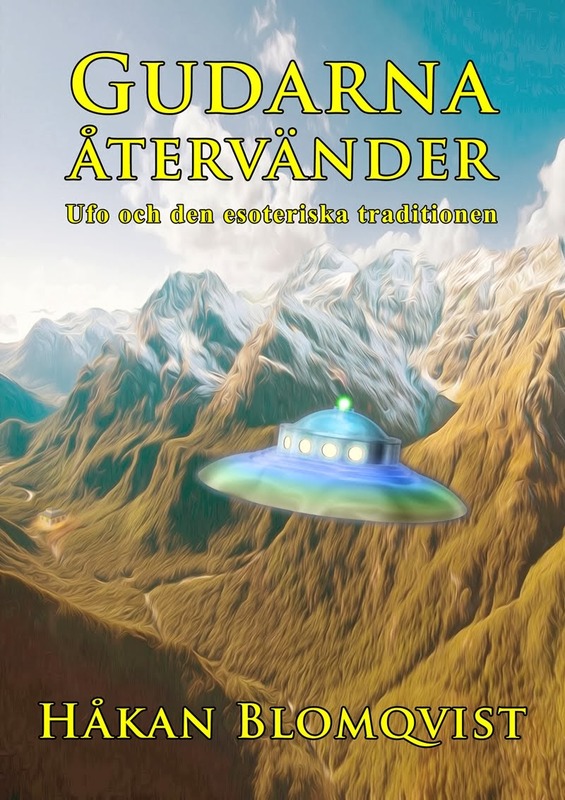 During these Wanderjahre he tried all sorts of jobs, not always living on the side of the law. His life changed when arriving in America. With a new wife and a new name - Talbot Mundy - he tried his hand at writing. Starting in 1911 he wrote for the popular pulp magazine Adventure and subsequently wrote more than 40 book, novellas and serials. 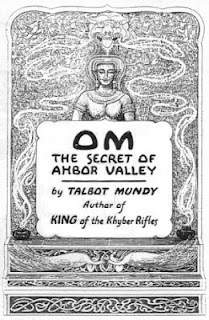 In 1922 Talbot Mundy discovered Theosophy and moved to the Theosophical commune Lomaland, located in Point Loma, San Diego and headed by Katherine Tingley. "The single most important action of his adult life", according to biographer Brian Taves. Mundy was admitted to membership in the Theosophical Society in 1923 and soon became a popular och charismatic public speaker in the society. "Blavatsky´s pen stirred in me something deeper and more challenging than I had known was there and capable of being stirred", he wrote in The Theosophical Path 1925. 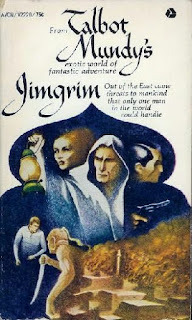 From the 1920s he produced novels that were a combination of adventure stories and esoteric philosophy, with titles like Om, The Secret of Abhor Valley (1924), The Nine Unknown (1924) Jimgrim (1931). "Another thing he has discovered is the use of anti-gravity — his name for it. Mathematicians, of course, have understood for centuries that each law has its opposite; but it took Newton to reveal the law of gravity as a practical fact; and Dorje seems to be the first since the Atlanteans to put in practice what his Chinaman discovered from the tablets about antigravity — which is the principle on which his airship works." "I don't believe one word of that," said Henri de la Fontaine Coq. "Nothing can fly without gravity — not even a what-do-you-call-it — a blimp." Grim grinned. "That is how he has preserved his secret. Nobody believed a word of it. His ships have been seen and reported by any number of people. He has two of them. Nobody believed the tales about chlorine gas until it wiped out a division at Ypres. Who believed in the telephone? It has been the same with Dorje's airship. And if you want rather worse humiliation than Bell got when he talked telephone, try talking anti-gravity to a group of scientists. Discoveries are made by unlearned men. The learned merely recognize them and perfect them after jealousy and incredulity are bankrupt." The ships are described as soundless and moving on earth´s magnetic currents. They are also partly translucent. The theme of adepts guarding a secret "vimana" technology is also developed in Mundy´s novel The Nine Unknown. Nine adepts are guarding nine books of secret knowledge. Book number six has information on gravity and antigravity aircraft. 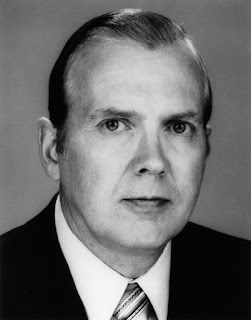 The books of Talbot Mundy are fiction but can be compared with the controversial claims of Richard Kieninger, founder of the new age community Stelle, Illinois. 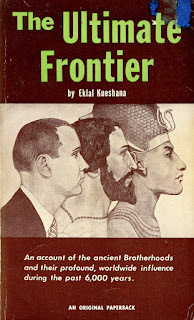 Kieninger is the author of The Ultimate Frontier (1963), written under the pen name Eklal Kueshana. In a small booklet, Observations (1971), Kieninger wrote that the secret Brotherhood that contacted him use flying saucers: "... some are interplanetary vehicles, others are of earthly origin. The ones which are from this planet are saucer-shaped of generally trapezoidal cross-section with three hemispherical engine pods on the underside. They were first developed by man on this planet about 20,000 years ago and have been used by members of the Lesser Brotherhoods continously since that time." I corresponded with several members of the Stelle community between 1979 and 1995. In a letter 1979 I asked Richard Kieninger how the brotherhoods could keep their retreats (bases) for the flying saucers secret from the military and CIA? He answered that "there are isolated places in the world which are safe from detection, and the Brothers know where those places are." (Letter Nov. 12, 1979). Kieninger, to my knowledge, never claimed observations of or trips in flying saucers. But his contact experiences resemble in many ways those of american contactee Howard Menger. Talbot Mundy and Richard Kieninger, in their different perspectives, present versions of the esoteric intervention theory. This is a vast and largerly unexplored field for both ufologists and students of the esoteric tradition.